Melting ice is an enemy for Arctic communities—especially those that hug the coast. Decreased sea ice and thawing permafrost can increase the risks of coastal erosion. How? Less sea ice means that ocean waves travel over more open water and gain strength before breaking on shore. The shore, already weakened by thawing permafrost, is more likely to erode. 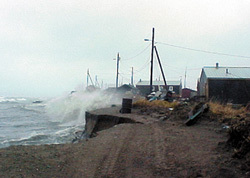 A stormy sea lashes the village of Shismaref, Alaska, where the coastline has eroded 30–90 m (100–300 ft) in the past 30 years.